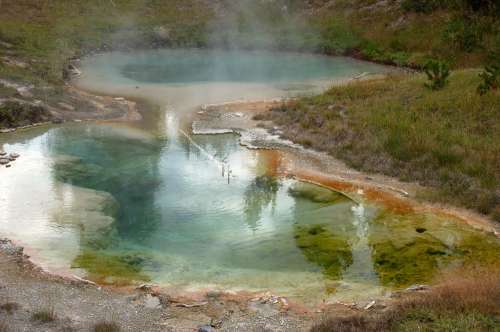 This is one of the hot pools in Yellowstone National Park near the south entrance. The pool is created by volcanic activity which forces the water to heat up and rise to the surface. The colorful water is created by algae that lives inside the hot water, which is about 170 degrees Fahrenheit. I like seeing the steam and the reflections in the pool - nice job,.